I’ve been working on a story about prisons. As I investigate the history of crime and punishment in Western society, I’m struck by the influence of G.B. Piranesi’s famous renderings: everybody refers to these, cites them, uses them in a frontispiece. 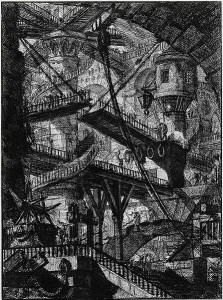 Le Carceri d’Invenzione was a fanciful perspectivist set of etchings from the 18th century, and in some ways they look more like dungeons than prisons. This fact certainly speaks to a strong current view about the nature and purpose of incarceration, but I suspect the influence of this artwork partly comes from modern analogues (e.g., M.C. Escher) that may in fact have been inspired by it. Beyond that, prisons retain a chilling mystique. In the artist’s time (and beyond), the humanist notion that architecture both shapes behavior and echoes the character of the people who inhabit it was even more powerful than today. The question is not what these old pictures of imaginary prisons tell us about 18th century Italy, but what our fascination with them tells us about ourselves– especially our fear and darker desires. Hospitals are also institutions that house large numbers of people. For them, too, architecture and environment shape behavior and echo the character of the society that creates them. It’s pretty clear that a healing environment that makes room for the arts is a superior environment to one that doesn’t. As long as there have been prisons in the West, there has been tension between people who think they should reform inmates (e.g., through religious conversion) and those who think they should punish inmates, usually in order to deter other criminals from committing crimes. Both groups agree that prisons exist to remove criminals from society so they can’t offend again (while in prison). Healing in prison is an interesting way of looking at it, and bringing the arts into play remains the exception rather than the rule, as far as I can tell. I like it, though. I’ve spent the winter translating lots of writings about Chinese prison life in the Cultural Revolution. Once they are edited and in a bit better shape, should share some with you… what are you working on? The story is a draft report from an unnamed functionary, perhaps a cleric, on his visits to the prisons of a remote province. “Draft” means that we get to see lines he decides to delete or add. The time and place are vague though it sounds like a New World colony. Most of the materials on prison history that I’ve found locally are about Europe and America, and I’d be very interested to learn more about incarceration and punishment in Asia.